@manmeet-22 - the second instruction in the following video asks you to set company domain as android.example.com. You have set your company domain as androidexample.com and hence you needed to change the above gist. Good job identifying what to change to match your package ! I just deleted the code starting at @override on my project then pasted the code from this page starting with Line 9 @override and down. 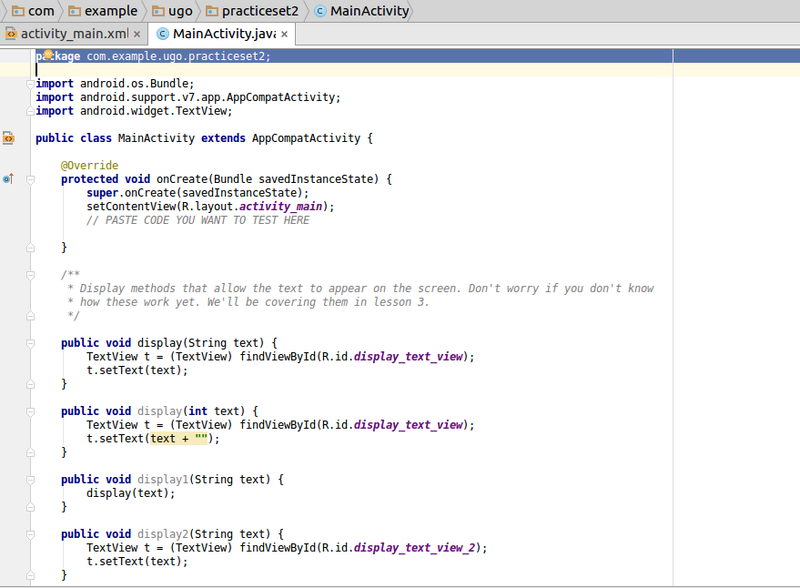 I had no errors except for display_text_view which I will fix as I continue to code my project. 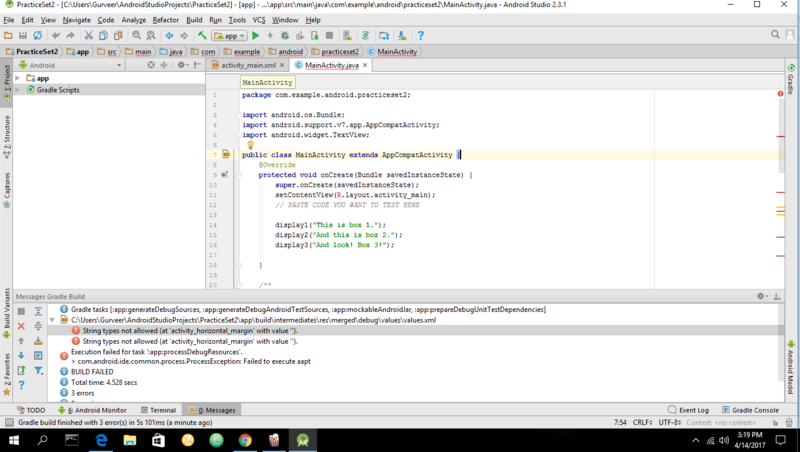 All the capital R turns red on my Android studio. What is your advice? In your file delete everything starting with the line public class and copy in the everything from the code above starting from the line 7. The R.id requires the XML that will be pasted after the Java code. There is no problem showing in Andriod studio but in mobile it says application failed to start. 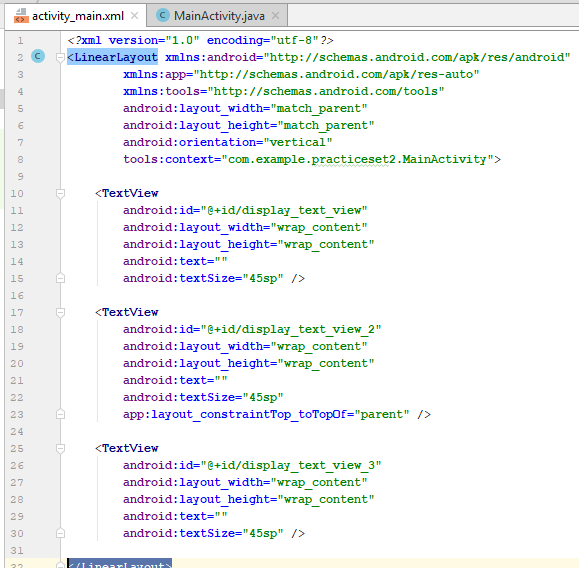 In XML preview in Andriod it also don't show the display text. Looking to hear from you guys. Same problems over here ? Have you figured out what is the issue ? Do you gyus have the project name as Practice Set 2, or Practise Set 2? The thing is it should be practice with two "C"s, not with a "c" and then "s". 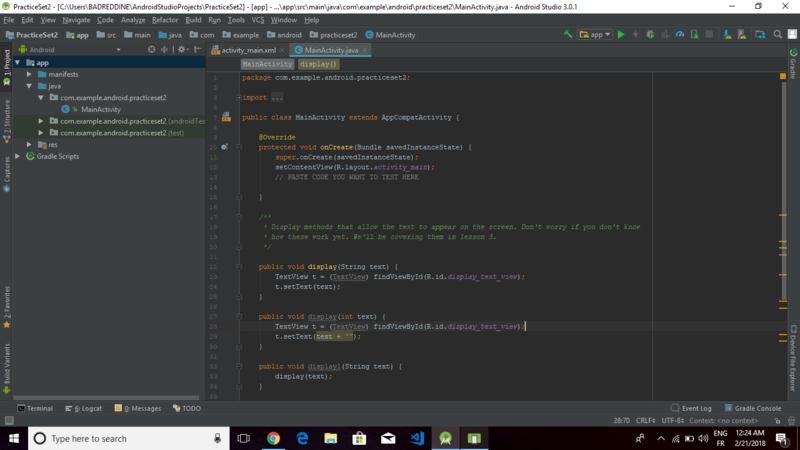 hi all, after copy code, android studio error: can not resolve symbol "display_text_view"
hey dude, just do what pommereh said. Close the project and open it again. I had the same issue and it seemed to resolve it for some strange reason. On the side note, can anyone explain what has happened and why does close/open project solves the problem. 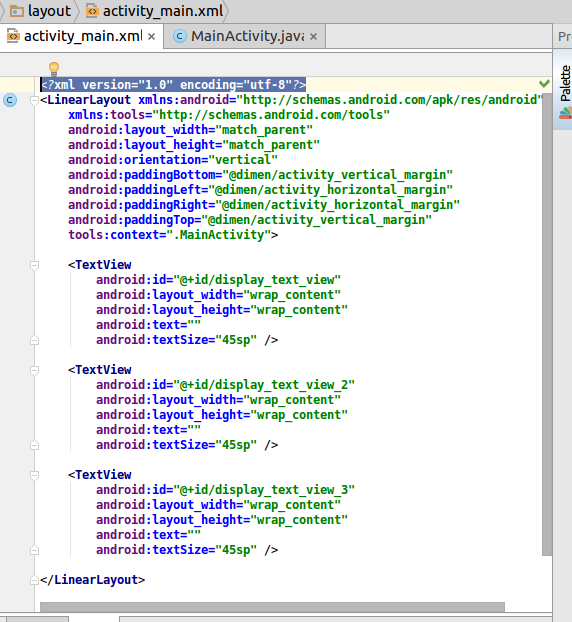 For those with MainActivity in the activity_main.xml showing red, I solved this when I noticed that android was misspelled in the app folders. I had andriod instead of android. This was not immediately obvious as yoU can imagine and hope it helps somewhat. No need to close and reopen the project in case of error: cannot resolve symbol "display_text_view"
I could only solve the "can not resolve symbol "display_text_view"" problem by copying in the XML code as well. @aulakhgurveer I have the same problem did you find a solution ? $ adb shell am start -a android.intent.action.VIEW -c android.intent.category.BROWSABLE -d https://android.example.com/example -n "com.google.android.instantapps.supervisor/.UrlHandler"
Unexpected error while executing: am start -a android.intent.action.VIEW -c android.intent.category.BROWSABLE -d https://android.example.com/example -n "com.google.android.instantapps.supervisor/.UrlHandler"
Help me to resolve my above problem.......Please. as you can see the same name "practiseset2" so then you will be just fine! All works for me, thanks a lot. so. what i should to do? On my java Mainactivity the TextVier is red!! to look like: "And look! Box 3!" it works after changing the package name. Do not delete your first line of code ! I was able to get it work by changing the a few things such as tools:context, and changing the layout from constraint to Linear Vertical. Here is the code .